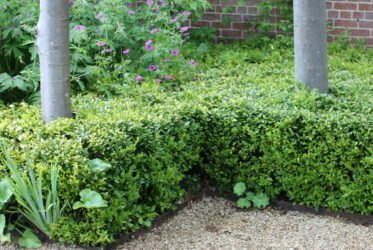 As many people are discovering, box plants are falling foul of box blight and more recently, box caterpillar, and so we don’t now ever recommend box for new planting schemes. 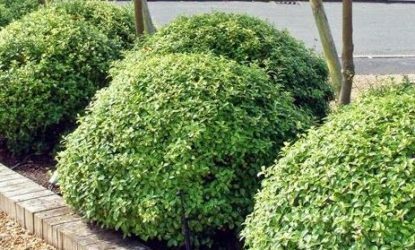 Which is a shame, as it has a variety of forms, uses, structural benefits, tolerance of shade and a variety of soils – in short a bit of a wonder plant. 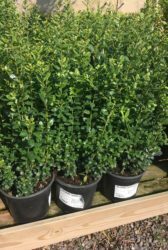 Ilex crenata (pictured left, the ‘Caroline Upright’ variety) – the first choice of most nurseries nowadays – similar colour, leaf size and form to box. Slowish growing and in high demand, so about twice the cost of box! Surprise, surprise. Euonymus ‘Green Rocket’ or ‘Jean Huguenot’ – slightly coarser cousin, still does a good job. Sarcococca confusa – for deep and dry shady places, but tolerant of some sun too. Usually grown as largish shrub but surprisingly clippable, as here round base of trees in Broughton Grange.